This coming February, I will have been training in BJJ for six years. It has been quite an experience, and I hope to continue on this path for a very long time. 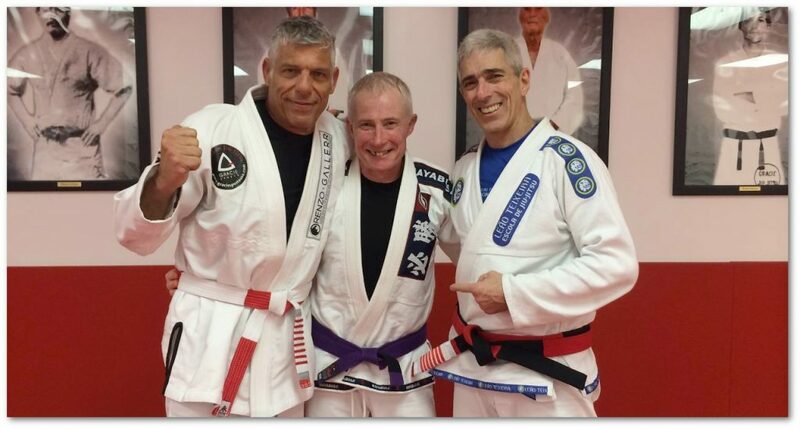 I started training when I was sixty-five and along the way I have discovered certain “realities” about being an older grappler that generally aren’t spoken or written about in the BJJ Community. 1. Don’t compare your current abilities to those that you had when you were 25. None of us have the same physical abilities at 65 that we had at 25. Making a comparison will only lead to disappointment. Rather, enjoy the fact that you are still able to get out on the mats and roll with the younger folks. 2. Focusing on Escapes should be a priority. For the most part, BJJ students like to learn various attacks, but older students really need to concentrate on how to counter attacks and escape bad positions. We really don’t have the speed to match younger practitioners. As a result, we often find ourselves at a disadvantage when rolling. Having the ability to escape from compromising positions does wonders for your confidence. The best program on escapes that I have seen is “The Ace of Escapes” offered by Professor Gustavo Gasperin. I have used his techniques to save my tail on many occasions!!! 3. The targeted audience for the lessons taught in most BJJ classes is students in the twenty-five to thirty-five range. Accordingly, many of the techniques shown simply do not work for an individual in their sixties. My days with the abilities to successfully use techniques such as the “berimbolo” are long gone. 4. Find a game that you are comfortable with and that you can implement on a high percentage basis. Trying to use an open guard game against young athletic opponents simply will not work. You will never be as fast as they are. Perhaps, closed guard or half-guard games are the way to go. In my own case, I like to use the Lasso-Guard because of my grip strength. 5. Find a coach who you enjoy working with and who understands your abilities and limitations. A good coach is extremely valuable to any BJJ student, but particularly to older individuals since many of the techniques commonly demonstrated in class will have to be modified for their use. 6. If you think you can roll hard every day, you are only kidding yourself. I have trained that way in the past, and it inevitably leads to injury. You can train everyday, but a significant part of your time should be spent training on technique. Hard rolling should be limited to two or three days a week. Also, short periods of rolling are more beneficial than long periods. In other words, it is better to roll three 5 minute rounds three days a week, than try to pull off six eight or ten minute rounds three days a week. The longer rolls will take a lot more out of you, and the additional time spent recovering will set your progress back. 7. Plan on scheduling alot of your training sessions off of the mats. You will need to put in the extra time off of the mats to work on your strength, endurance, mobility and flexibility. Just going to class is not enough for the older student to keep progressing over the long haul. 8. Choose your training partners well. Training should not be easy. It should be challenging, but beneficial to both individuals. Rolling with young white belts who are trying to demonstrate their prowess can be problematic. This is particularly the case with fellows with a wrestling or football background. When you are older, injuries often take longer to heal. Minimize the risk! 9. The Japanese have a term “mushin”, which can be interpreted as a mind not fixed or occupied by a particular thought or outcome, and thus open to many possibilities. Focusing on the process occurring during a BJJ match, rather than on the ultimate outcome of the match is often beneficial to older grapplers since they will often find themselves in difficult positions where they will need to keep their wits about them. 10. In the end, take great joy in meeting new friends, sweating and training together. Think of ways to add to the BJJ community. In my case, I like the idea of working with older grapplers, special needs folks and people with challenging economic backgrounds.